This post is one of a series of essays written for the New Amsterdam Market. Each essay stems from a conversation between the author and a vendor who participated in the New Amsterdam Market of June 29th. The essays seek to address each vendor’s (food-related) enterprise, to highlight the reality behind their commitment to sustainability, and to convey the voice and personality that they bring to their work. Brant Shapiro probably doesn’t get interviewed very often. He is a true purveyor, a grocer, a man whose work is rarely appreciated in today’s food system. Consumers don’t necessarily consider the products in one grocery store as any more difficult to source than the products of a more “healthy” food shop. And one might assume that Brant’s store, The Health Shoppe, could get large quantities of organic produce as easily as any non-organic items. Even if we’re aware that it is more difficult, we all know Whole Foods isn’t struggling to put food on the shelves, so who’s to say Brant’s business is any different from Whole Foods? The Health Shoppe is smaller, for one thing, and isn’t considered “gourmet.” But the biggest difference, in fact, is the shop’s dependence on an individual like Brant. In the 1950s, Brant’s great uncle established the first health food store on Long Island. His father and uncle worked there until 1969, when they opened their own store, The Health Shoppe, in Morristown, New Jersey. They expanded the business to include four locations, each of them sites where one could find a selection of vitamins, supplements, and minerals. By the time Brant came on the scene in the’90s, a different sort of health food store was a spreading phenomenon. Bread & Circus became the largest natural food retailer in the Northeast, before it was bought by Whole Foods in 1992. And it was around this time that Brant decided to convert The Health Shoppe into a store where customers would find a selection of produce and food products, in addition to the former vitamin-rich inventory. Brant is responsible for sourcing that selection. As Anita Lee began explaining what it means for Bo Bo to sell “Buddhist Style” chickens, I realized I had asked her to break down the poultry business into more basic terms than she might have imagined. I didn’t need to ask twice. Nearly overflowing with youthful cheerfulness, Anita offered to tell the story of Bo Bo Poultry. She is a woman, who, through self-reflection, has boiled “sustainability” down to her own base definition: Telling the truth. Richard Lee’s original live poultry market in Manhattan was regulated by the State, and thus the products of the shop were restricted for sale to in-state HRI (hotels, restaurants, and institutions). Bo Bo Poultry earned a USDA license for a facility they built from scratch in Williamsburg in 1998, and their business has expanded ever since. In addition to full-size chickens, the shop sells poussins, fowl, quail, partridges, silky, quail eggs, roosters, and rabbits, based upon season and availability. While the U.S. poultry industry is primarily based in the Southeast region of America, Bo Bo’s farms are spread throughout New York and Pennsylvania. 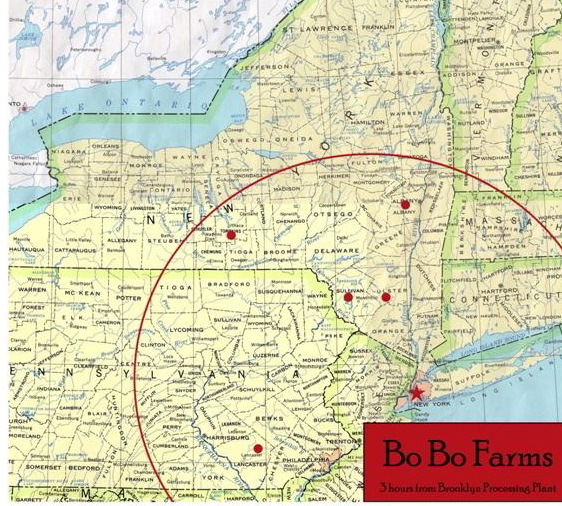 A map of Bo Bo’s farm locations reveals they lie a maximum distance of 200 miles from the processing plant in Williamsburg. According to Anita, it’s currently more sustainable to raise poultry in the areas outside the SE region. Bo Bo’s farms invites community farmers to pick up the chickens’ manure to be used as fertilizer, for example, whereas many Southern poultry farmers find they need to truck their manure thousands of miles to reach farms who can use the manure from this poultry-rich region. Otherwise, the waste is often kept in lagoons, which can runoff onto neighboring properties. The New York Area also happens to be the main Asian distribution capital of the East Coast, a convenient destination for Bo Bo’s wholesale distributors. Anita emphasized that Bo Bo chickens are a very good quality, simple product. The chickens are free roaming, slow grown, and raised without antibiotics or hormones. “Pastured raising is difficult,” Anita mentioned, “In order to supply the demands of a city like New York, you would need to dedicate all of New York State as farmland.” Having just read Michael Pollan’s The Omnivore’s Dilemma, she was keen to consider how Bo Bo might improve their practices. Pollan spent a chapter of his book highlighting the pasture-perfect system of Polyface farm in Virginia, and Anita mentioned how she’d like to visit their farms one day. “But if Polyface raises about 12,000 broilers a year,” she said. “they can’t feed New York City. You can’t feed our population with 35 chickens a day.” Anita also mentioned the way Joel Salatin won’t ship chicken via mail order. “That way he only reaches a small community,” she said. “Bo Bo aims to be the middle ground, enabling greater access to good, simple, products consistently, at an affordable price. The Queens County Farm Museum lies a few miles South of Little Neck Bay, occupying forty-seven acres in the Northeastern section of Queens, New York. It is the largest remaining tract of undisturbed farmland in New York City. The farm dates back to 1697, when the Adriance family began farming on the parcel they would own throughout five generations, for over a hundred years. New York State bought the land in 1926, to grow fruits and vegetables for the rehabilitation of patients at the Creedmoor State Hospital. In 1975, New York State Senator Frank Padavan wrote the legislation that transferred ownership from the state to the New York City Department of Parks and protected the site from future development. Today, the Queens County Farm Museum is still owned by the Department of Parks, and is operated by the Colonial Farmhouse Restoration Society of Bellerose, which seeks to preserve the historical buildings and stories of the land from the 1930s. 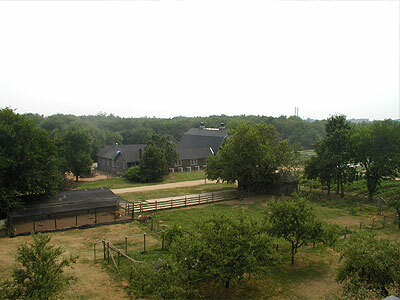 As a New York City Landmark, the Farm Museum is on the National Register of Historic Places, and provides many educational programs, public events, and services. More than 500,000 people visit the site each year. At thirty-three years of age, Michael Robertson is the first farmer to cultivate the land of the Farm Museum in over fifty years. Originally from a suburb of Kansas City, MO, he studied philosophy in Boston, and spent time on a farm in Guatemala before returning to the States to begin farming in Texas. Most recently, he worked as an apprentice at Hawthorne Valley, a 400-acre biodynamic farm in upstate New York. Just last year, realizing he wanted to farm and live in New York City (if at all possible), Michael rather fortunately happened upon the website of the Queens County Farm Museum. He called to ask if the Museum might be interested in hiring a farmer and converting the property back into a working farm. The answer was yes. Of the forty-seven acres of the Queens County Farm Museum, about seven are occupied by visitor attractions: historic buildings, the Amazing Maize Maze, and a pumpkin patch planted for Pick-Your-Own-Pumpkin weekends in October. Another twenty-five acres are brush and woods, overgrown with decades of unfettered, invasive plants. Michael is currently cultivating one of the remaining fifteen acres – with the help of compost from the city – and plans to expand this space in the near future. While approaching the farm with a knowledge and understanding of the biodynamic methods of Hawthorne Valley, and of the sustainable practices of Joel Salatin of Polyface Farm, Michael must take baby steps towards the reestablishment of a real working farm on the Queens property. The Farm Museum has existed primarily as a historic landmark for the past thirty years. The Colonial Farmhouse Restoration Society has kept sheep and goats at the farm for the purpose of seasonal events and festival entertainment. While the individuals running the museum are receptive to the idea of converting the land into a working farm, many of them have little or no experience in productive agriculture. “In my work here, I have to be flexible to accommodate the needs of education and entertainment,” Michael explained. There will certainly be a period of adjustment as current priorities (three or four busloads of visiting children per day, a non-organic corn maize, animals for petting, and historic preservation) coordinate with the needs and requirements of sustainable agricultural production. If all goes well, Michael will sell his produce at the Union Square Greenmarket throughout the coming fall and winter. While the Farm Museum depends largely upon grants and education programs, Michael hopes the farm will one day be not only environmentally but financially sustainable. Over the next few years, he will assess the potential for cultivation on the acres currently overgrown with woodland and brush. He hopes to farm about eight to ten acres, to raise animals for fiber on the cleared pasture, and eventually to start up a micro-dairy. He has little doubt about the healthy local market for fresh produce. Michael already delivers fresh vegetables to a few restaurants in his neighborhood of Greenpoint, Brooklyn, and eventually he would like to organize Community Supported Agriculture (CSA) membership for the farm, while continuing to sell at the Union Square Greenmarket in Manhattan. Michael estimates he might eventually supply a CSA of two hundred members, though increasing production to this level will of course require hands and arms besides his own. He imagines creating a sort of miniature CRAFT program for Long Island. CRAFT, or the Collaborative Regional Alliance for Farmer Training, is a cooperative effort of organic and biodynamic farms in the Hudson Valley, the Berkshires, and Pioneer Valley, organized to enhance educational opportunities for farm apprentices. While the creation of a similar program, to connect the farmers in Long Island, is a long way off, Michael will certainly be using what community support and knowledge he can gather, as he is the only farm in the city larger than an acre or two. Not that farming in New York City is lonely. “Most people decide where to live based upon proximity to family and friends – based upon community,” he said. “My community is here. I didn’t feel I should have to isolate myself, to be a farmer.” While he has a lot of work ahead of him, the Queens County Farm Museum does allow a farmer the best of both worlds. Michael, as he’d hoped, is able to cultivate true farmland and still live within his own urban community.